I’ll confess, I have no idea how my training is going. I know my runs have been feeling great (yeah! ), but is that enough to prepare me for race day? How many miles should I be doing in my peak weeks of training? I feel like a total newbie again. It’s been a long time since I’ve gone into a race with absolutely no idea what to expect. Sure, I often feel underprepared for races, but I’ve never (truly) doubted I was preparing correctly. Another day where I did extra stretching, but no true yoga. I’m still feeling surprisingly good considering all the extra miles I’m running. Overall, I’m tired, but nothing stretching and foam rolling can’t take care of. I went to an event tonight at GU HQ in Berkeley – a taping of the ‘Another Mother Runner’ Podcast. They were interviewing Katie Arnold about her new book ‘Running Home’. It was a fun time. I ran into a number of people from the running club, and of course, there were GUdies. GU is pretty liberal with their freebies. On the docket today – sunshine, short sleeves and a whole lotta wind. On most days, I run in the morning. I’ve been playing around with late morning/lunch runs lately and sometimes I head out in the evening. Today was a rarity – an afternoon run. It’s just what worked into my schedule today. It felt really odd and it messed up the balance of my day, but sometimes you have to do what the schedule demands. I didn’t do my usual strength work. I just couldn’t make the timing work since I had to get off to my volunteer gig taking care of the kitties waiting for adoption after my afternoon run. Since it was a super quiet night at the cat center (it’s the calm before the storm- kittens will be arriving en masse in just a few weeks) so I did a bunch of squats and other strength work while cleaning up. Not exactly the same, but something is better than nothing. I was only planning on running 9 miles, but ended up doing 10.5 – i lost track of how many laps i did of the lake. Oops. This morning I ran to and around Lake Temescal. The plan was for 9 miles. To make the mileage work, it would be there, 2 loops, a little bit more and home. I ended up going too far on ’the little bit’ and decided to just do another full loop, so I ended up doing 10.5 miles. I’m really not doing a very good job keeping to the mileage on the schedule, but I suppose that’s what happens when you throw your training plan together at the last minute and don’t have a whole lotta faith in it. After a few weeks off because of weather, night trail runs are back. But after the time change, they are now sunset/twilight trail runs. Even after days of sun, the trails are still a little sloppy in places. I felt surprisingly good on this run considering I’d already run 10 miles on the day. Is it possible I’m actually properly preparing for this thing? Usually, if I’m to struggle with a run, the struggle is in getting out the door. Today was different. I got up and out the door just fine. But starting at about mile 3, I kept wanting to cut it short. I kept trying to renegotiate the run with myself. If I turn here, the run would still be 5 miles, close enough, right? I could just go around the courthouse and it would be a 6-mile run. That wouldn’t make too much of a difference… right? I made it the full 7 I had planned, but it was a struggle. Once again, I did a bit more than my usual amount of stretching, but not much else. Last group run before the Oakland Marathon next week. How fast 18 weeks has gone by! The group did 10 miles. The half marathoners and the marathoners ran the whole distance together and it was a surprisingly large group. While I love that the slower groups are getting more popular, I’m not used to running with such a large group of people. A little bit of my people-claustrophobia was kicking in by the end. Like last week, I knew I was going to run more miles on my own, but I wasn’t sure exactly how many miles I was going to do. I figured I’d do the 10-mile route again, then play it by ear. I ended up doing an additional 18 miles, making it 28 for the day. Yikes. I would have liked to hit 30, but the area doesn’t have a ton of options, and I just couldn’t make myself do one more loop of the area. When I’m not pacing a group (when I’m obsessive about my pace), I run by feel, not pace. I was shocked when I saw my average pace for the last 18 miles was 9.47 min/ mile. Me? Doing under 10-minute miles for 18 miles? And feeling great while doing it? It was sunny all week, so I figured it was safe to go back to my favorite 13-mile trail – the Briones Reservoir Loop. While it was waaaay better than it was a few weeks ago, it was still super sloppy in places. Still worth it and it felt great to get back on a long trail run. I felt shockingly good considering I ran 28 miles yesterday. While I was sore today, it wasn’t anything unreasonable (it helped that I did a ton of foam rolling last night). I did have a noticeable energy crash right around mile 12, but I’m pretty sure it was more of a mental thing than a physical one- it coincided with a boring, flat, paved bit of the trail – the only such part on the whole route. I continue to be shocked that I’m feeling as good as I am considering the mileage I’m doing. 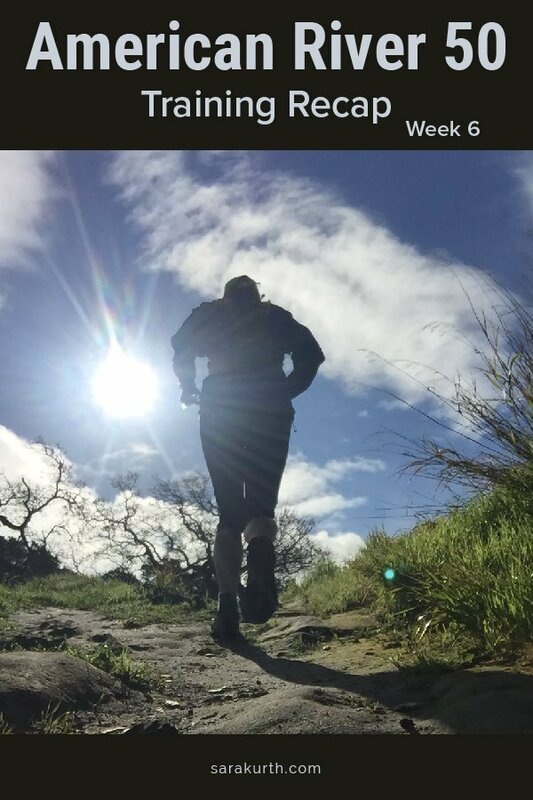 On the goals front – did 2 trail runs, lots of elevation gain, and lots of stretching. This, however, was the first week I whiffed totally on strength work. While I did some extra squats and stuff while volunteering, for my usual strength routines, I was 0 for 2. Thursday night, I went out for a walk and got really light headed. I realized I’d barely eaten anything all day. While marathon training, I usually finish a run feeling totally famished and like I want to eat all the food. I think with my extra mileage, I’ve reached the tipping point where I finish a long run and I’m just not in the mood to eat so I haven’t been fueling sufficiently. So I did a big Safeway run and stocked the freezer with pre-made healthy staples. I will fuel if I feel like it or not.